Want free pork, wine, and beer? Then enter this giveaway! 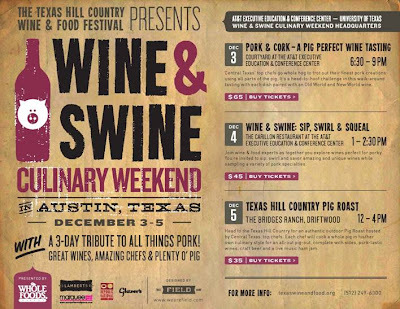 In case you haven't heard, a whole lotta wine & pork will be going on this weekend in the Austin area for the Wine & Swine Culinary Weekend (information below). The weekend will feature a different event each day. Sunday's event is the Texas Hill Country Pig Roast, where 8 chefs will each prepare a whole pig in their unique culinary styles. Throw in live music, craft beer, and wine tastings, & you've got yourself a few hours of awesome. The event will be held at the Bridges Ranch in Driftwood. Tickets are $35 each, but we're giving away two tickets!!! All you need to do to enter is email me by Friday at noon Central. (Or feel free to submit your name as a comment to this post or as a Facebook or Twitter post.) I'll draw the winner's name from a hat, and your 2 tickets will be waiting for you at the event. Central Texas’ top chefs will go whole hog for The Texas Hill Country Wine & Food Festival’s Wine & Swine Culinary Weekend, Dec. 3 – 5, 2010, featuring a chef and winemaker tasting, swine-pairing wine seminar, and an al fresco, not-to-be-missed pig roast in the Hill Country. In this three-day tribute to all things pork, Central Texas food and wine lovers will enjoy great wines, amazing chefs & plenty o’ pig. Here's what I brought back from Lubbock: 4 kinds of beef jerky from Sograte BBQ & Brew. We've made quick work of them over the holiday. I've already ordered more. From left to right: Original, Smokin Habanero, Texas Heat, & Teriyaki. (Sograte also has Black Pepper and Chili Lime. View all of their jerky here.) Check Sograte out on Facebook & Twitter. Pics from my visit to Sograte to come. Todd, a Man Upper since Day 1, hit up Schoepf's Old Time Pit Bar-B-Que in Belton on his way home to Dallas for Thanksgiving. 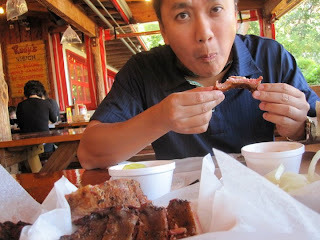 From the looks of the pic he sent me, he had a healthy serving of brisket, pork ribs, ham, & turkey. Well done, Todd. Exit 294A on I-35, folks. Go about a tenth of a mile West. Then, stop and eat! QOTD: Where is the best turkey in Texas? Tuesday, I asked where the best brisket in Austin is. Today, for obvious reasons, I wanna know where the best turkey in Texas is! BBQ joint, caterer, competition team, backyard BBQ'er. All fair game. Where is Texas' top turkey? Happy Thanksgiving! Texas BBQ in France? Oui. Question: Is there a native of Taylor, Texas, serving up Texas BBQ in France? Answer: Yes. Yes, there is. His name is Klif Kruger. Check out his website, and join his Facebook group. 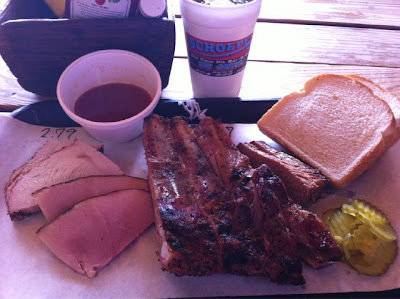 Klif writes, "The French know alot about food, but they don't BBQ like we do in Texas. This group is to support my goal to have a successful restaurant/catering business in France doing something I enjoy, eating and cooking BBQ. Spread the word, Texas BBQ is in France!" QOTD: Where is the best brisket in Austin? 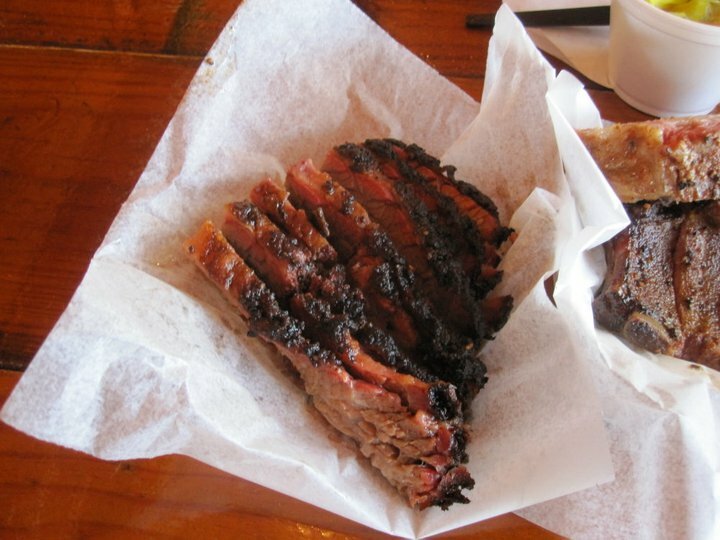 Whose brisket reigns supreme in the ATX? (Austin proper, not the metro area) Is it Old School BBQ & Grill? Texas Monthly says so. Is it Franklin Barbecue? The masses that stand in line every day seem to think so. Is it one of the 3 cuts that Rudy's serves up? How about Lambert's or The County Line or Iron Works or The Pit or Ruby's or Blue Ribbon or Cartwright's or Green Mesquite or Donn's or Bert's or Mann's or Texas Rib Kings or Smokey Mo's or Pok-e-jo's or any of the BBQ trailers around town? How about Austin BBQ caterers? Or maybe just a local competition team? Heck, maybe it's what you serve up in your backyard. So...whose brisket is THE BEST? 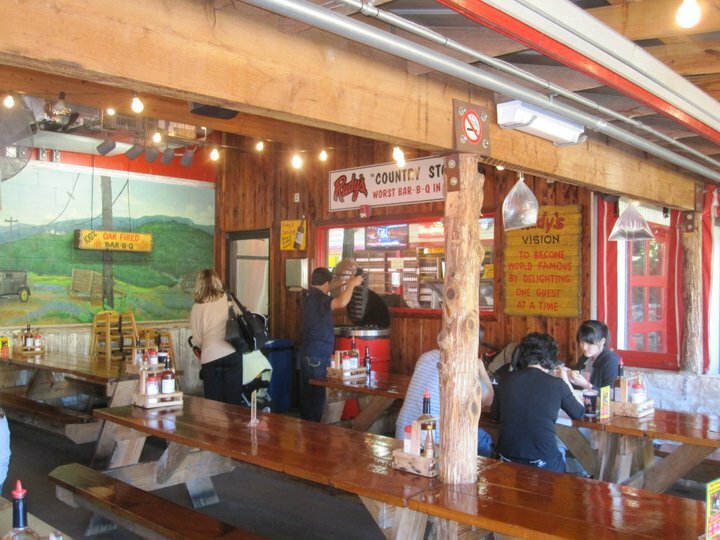 The Salt Lick now has a trailer at 1901 Rio Grande. Anyone been? If so, would love to hear your thoughts. So, by my count, you can visit TSL at their main location in Driftwood, in Round Rock by the Dell Diamond, at the Austin airport, and at 1901 Rio Grande. 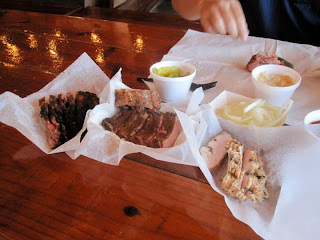 Just got word of a BBQ joint set to open in Dallas in early 2011: Lockhart Smokehouse. They'll feature "the great smoked meat classics that make Lockhart the Barbecue Capital of Texas." Check for updates on their Twitter page. The Q Card is on sale for Thanksgiving! Through Thursday, The Q Card is 20% off. Our current batch of cards don’t expire until the end of February 2012, so that’s just $8 for more than 15 months of BBQ savings. You won’t find a better deal! Just click here to purchase. So, whose BBQ would you smuggle? The Texas BBQ smuggling story has me curious. 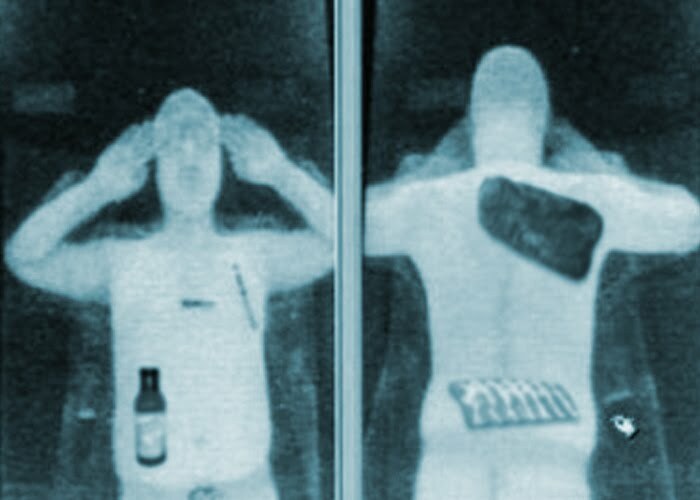 What BBQ - place(s) and item(s) - would you "smuggle" into your destination? Just assume normal options like mailing are not on the table. And assume that space is limited - underneath your clothes and maybe some luggage. Texas BBQ is so good it's smuggled. Dallas, TX – November 17, 2010 – Airport screening technology came in handy Tuesday when officials at Dallas/Fort Worth International Airport caught a man trying to smuggle BBQ out of Texas. Luckily, local BBQ aficionado John Stevenson was about to board a Southwest Airlines flight to Las Vegas in the adjacent terminal and was brought in to identify the contraband. “From what I could tell, it appeared he had a complete fully cooked brisket as well as beef ribs beneath his clothing. 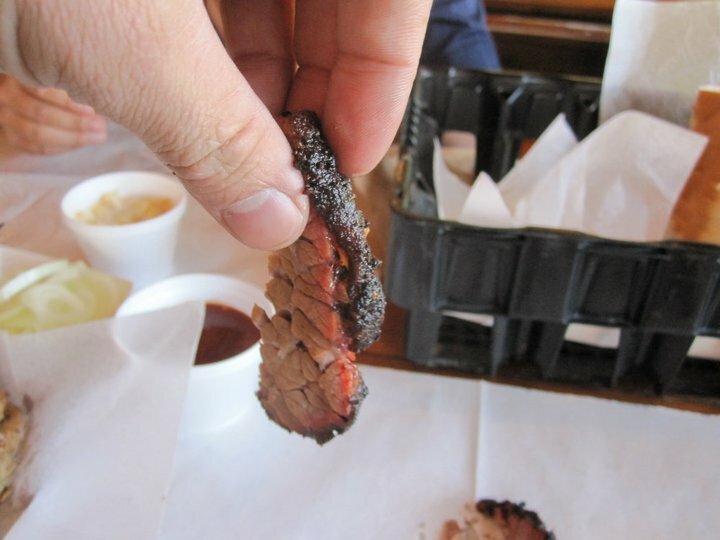 We knew he wasn’t from these parts as no one in Texas would dare use BBQ sauce on a perfectly smoked brisket.” A full bottle of sauce was found taped to his midsection, but it was unclear if this was going to be used on the BBQ in question. Authorities confirmed that trying to take BBQ out of Texas was not a crime, but felt “it was just the wrong thing to do” and that “Texas BBQ should stay in Texas, simple as that”. A “Don’t Mess with Texas” was heard muttered in the background, but it appeared to be coming from a man standing by a nearby magazine rack. At press time authorities still had the man detained for further questioning. How many people will attend UT's football game tomorrow? Not predicting scores this week. Instead, what's your guess for how many people will attend tomorrow's Texas-Florida Atlantic game in Austin? Closest person wins his/her choice of 4 pounds of meat from Texas pitmaster John Mueller! The game is at 2:30 PM Central - just about 24 hours from now - so don't wait to submit your entry! Email me, or post your guess as a comment below. QOTD: Any good BBQ in Lubbock? New Braunfels Smokehouse turkey recall. What's better than one Gameday Giveaway? Two.